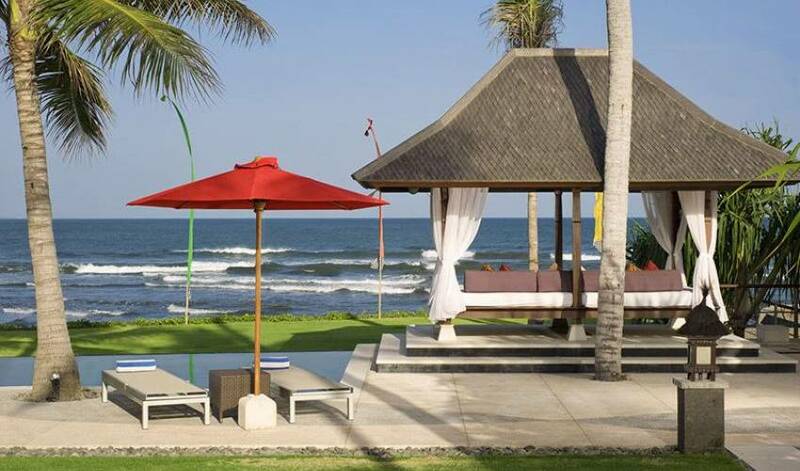 Villa Pushpapuri combines contemporary design with Balinese architectural elements and beautifully landscaped gardens to create a luxurious, spacious and very comfortable beachfront home on Bali’s south-east coast. 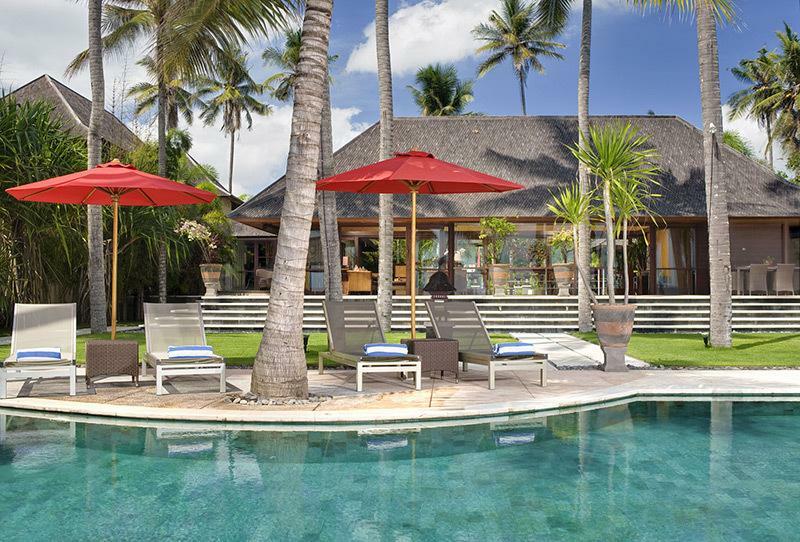 With individual pavilions housing the bedrooms and living areas, flanked by a private 20-metre pool, this four-bedroom villa offers its guests the exclusivity, serenity and beauty of a boundless ocean horizon accompanied by the soothing sound of the surf. 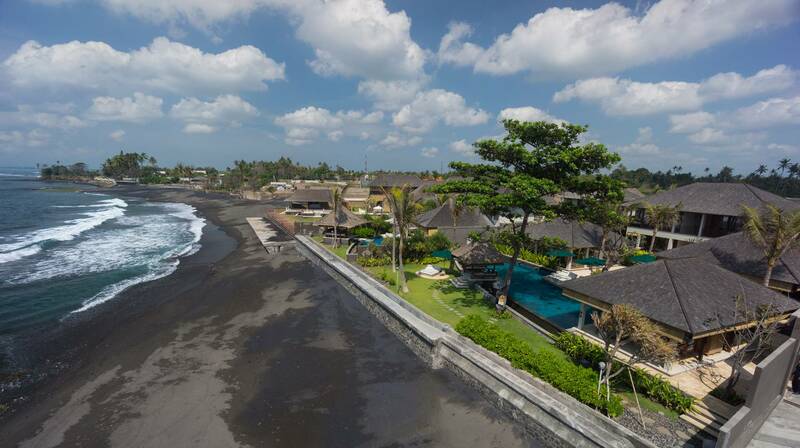 This adaptable villa is the perfect family retreat or wedding venue due to its stunning location (just 30 minutes from the airport), abundant facilities and the warm hospitable embrace of its staff. 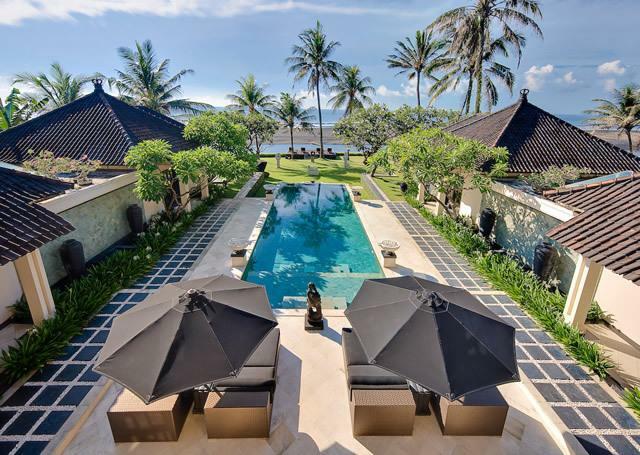 Situated absolutely beachfront, where river meets ocean on south-east Bali’s near-deserted Pabean Beach, the villa is blessed with captivating views of the pounding surf, mystical Mount Agung and the island of Nusa Penida. 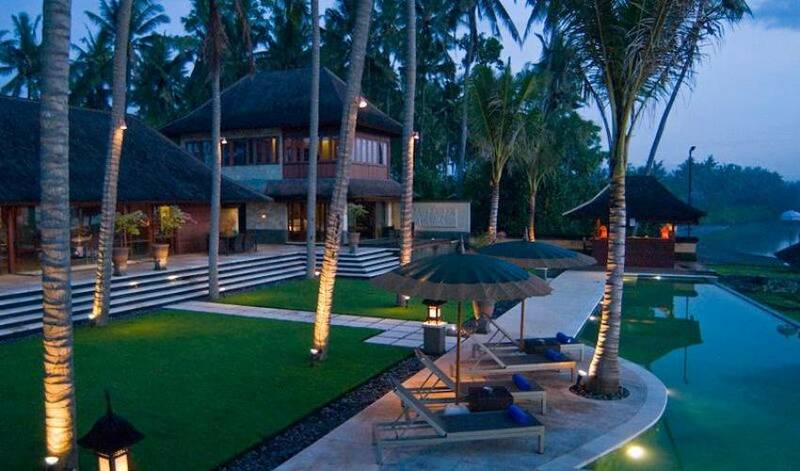 This beautiful secluded villa, surrounded by nature and wrapped in luxury, has everything to offer guests looking for a Bali seaside retreat. Fabulous for families and wonderful for weddings, this contemporary villa presents four richly decorated bedrooms, including a grand master suite with views from its upper-floor sitting room to inspire the writer and poet in us all. 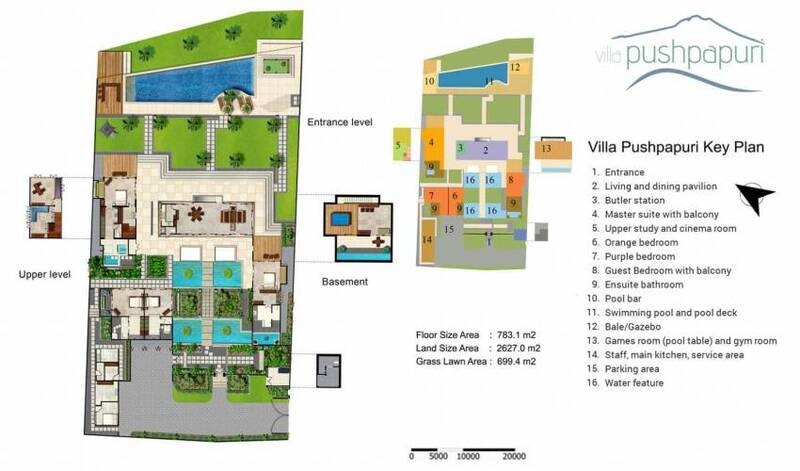 For relaxing and entertaining, the villa offers a splendid living and dining pavilion and a well-equipped games room, each complemented by the finest furnishings and five-star service. The villa comprises four pavilions: the main living and dining pavilion elevated above the garden and pool, with the games room tucked beneath it; the master pavilion offering magnificent views from its bedroom as well as its upper-floor sitting room and study, and two single-storey pavilions bordered by ornamental ponds, housing the three guest bedrooms. 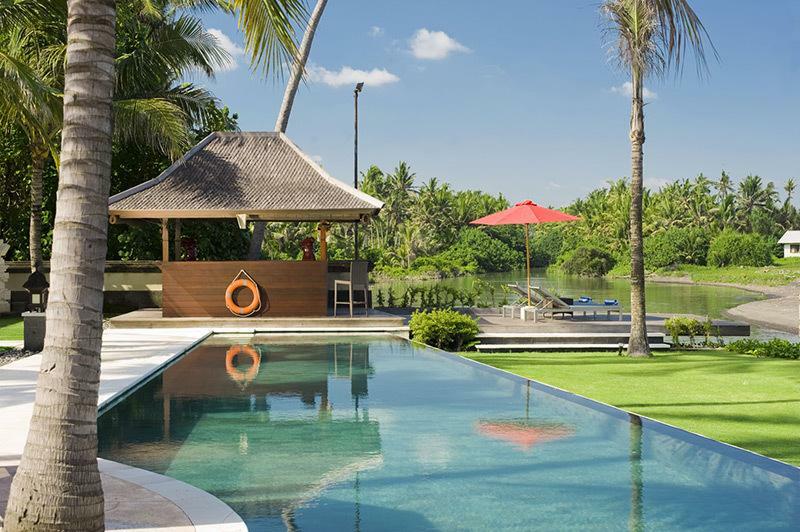 In the terraced coconut-grove garden, lawns step down towards the beach encompassing a 20-metre pool, cabana bar and relaxation pavilion on their way. Presiding over the garden is the living and dining pavilion, with glass doors that slide open on three sides allowing the sea breezes to permeate. 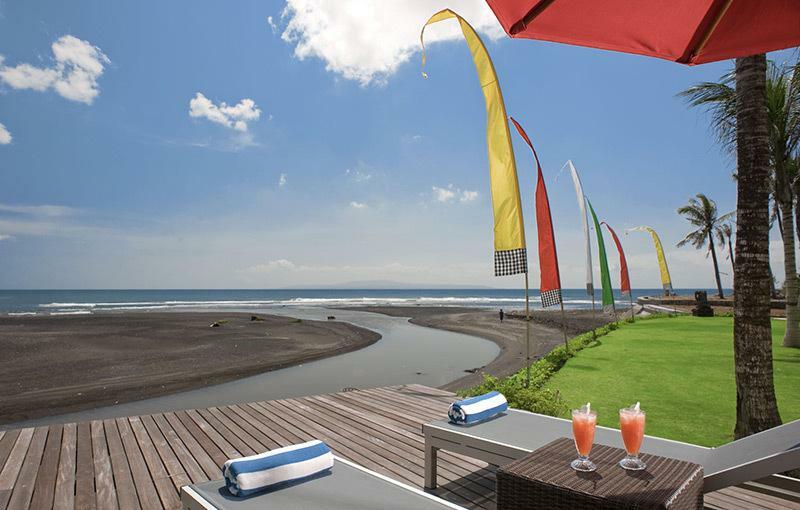 Here, you will be mesmerised by the sight and sound of the waves while relaxing in the sitting area or dining at the circular table. A sunny terrace at the front invites you to step outside for alfresco feasts. Situated below the living and dining pavilion, the air-conditioned games room features a curved ceiling reminiscent of a wine cellar and is equipped with a pool table, dart board, bar with six stools, and a large satellite-channel TV and DVD player. Despite being below ground level, there is plenty of natural light in the games room thanks to sliding glass doors onto a cool garden courtyard. 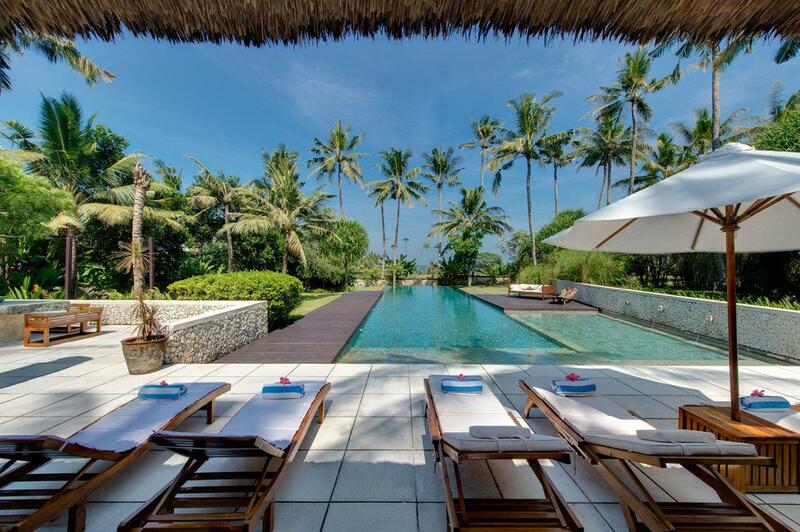 Dotted with towering coconut palms, the villa’s terraced garden is perfect for weddings. 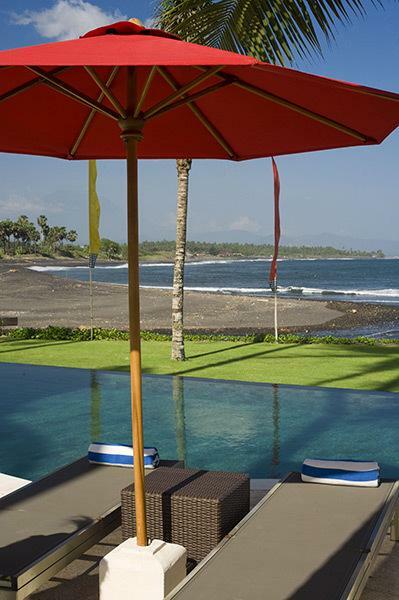 Smooth, beautifully manicured lawns flank both sides of the 20-metre infinity-edge swimming pool, separated from the beach only by a swathe of flowering creeper. 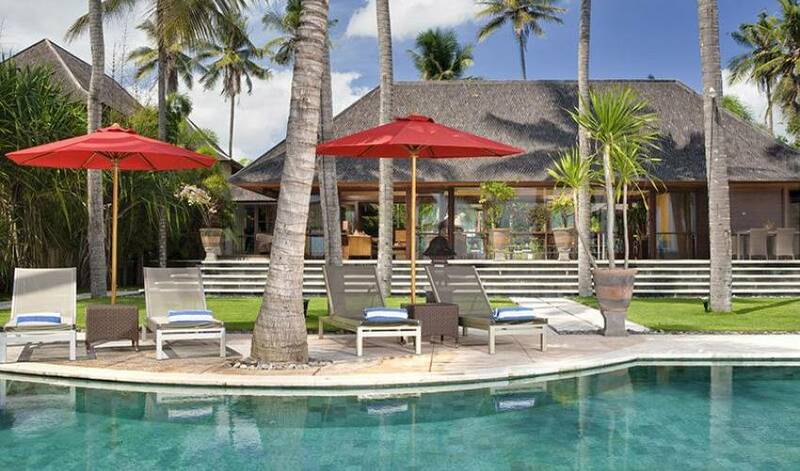 The stone pool deck is thoughtfully shaped to accommodate the trunk of a tall palm tree, which, along with a pair of red umbrellas, provides shade for the sun loungers. The cabana bar at the end of the swimming pool is a convivial spot for sipping cold beers or fresh fruit juices. 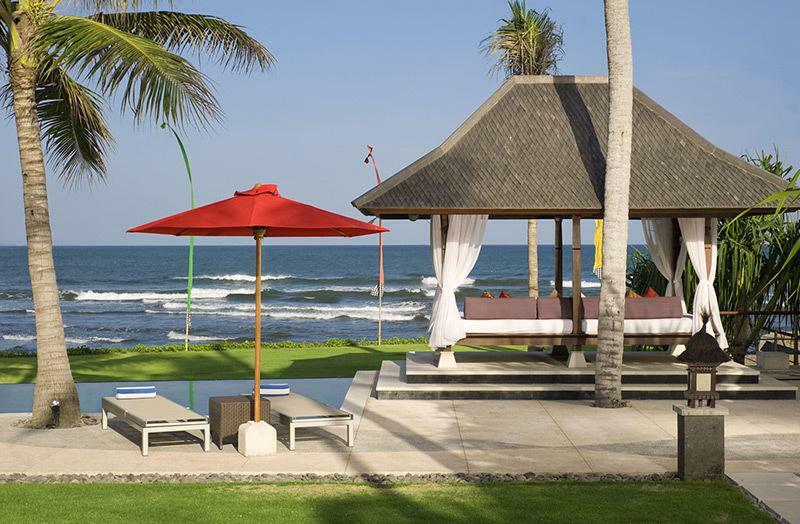 At the other end is a large balepavilion where mattresses and cushions are positioned for lying back and enjoying the view; this is also an ideal place for a relaxing massage. Swathed in soothing green – from the wall coverings to the shimmering curtains to the sheer drapes and silk cushions ornamenting the four-poster bed – the villa’s master bedroom is romance personified, and the unobstructed ocean views from the bed and sun deck are breathtaking. Carved doors lead to the marble-floored dressing area and bathroom, which incorporates a gorgeous outdoor enclosure bathed in diffused light with a rain shower, an indulgent jacuzzi tub and a fish pond. From the master bedroom, stairs lead to the upper floor where a sitting room is furnished with two sofas that can be converted into a bed for a child. The adjacent study has the best views in the house – no one wants to be working when they’re on holiday but if you really must check emails or write that novel then this is the place to do it. Themed in earth tones, guest bedroom one has a soaring roof, a built-in daybed and sliding glass doors on two sides ensuring space, natural light and views and sounds of the sea from the bed. The room’s queen-size, four-poster bed sits on a wooden plinth atop a marble floor and is enveloped in shimmering organza netting. A semi-open-air garden bathroom is fitted with a rain shower next to a fish pond, which provides the soothing sounds of falling water. Named for their vibrant colour schemes, and sharing a pavilion (making them ideal for kids or a family), these two guest rooms – purple is queen-bedded; orange has twins convertible to a king – are playful and funky with high ceilings, shimmering curtains and nets wrapped around four-poster beds. The ensuite garden bathrooms are both fitted with rain showers – the purple room also boasting a luxurious sunken bathtub. All bedrooms are air-conditioned and equipped with flat-screen satellite-channel TVs and DVD/CD players. 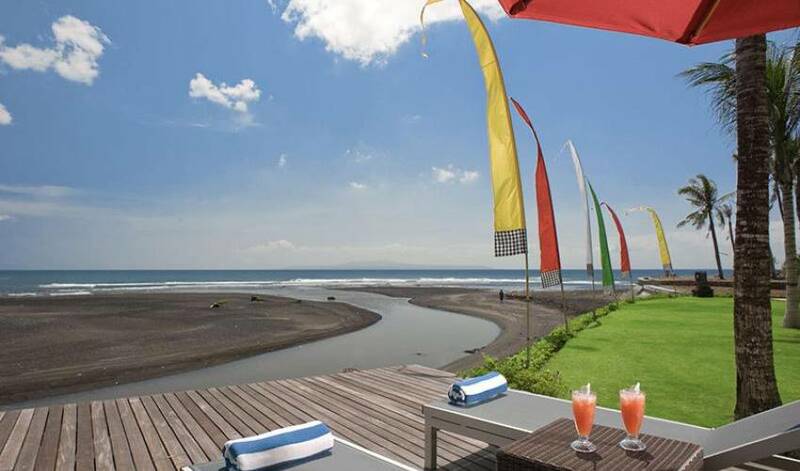 The villa is located on the River Wos estuary at Pabean Beach in the village of Ketewel in south-east Bali. 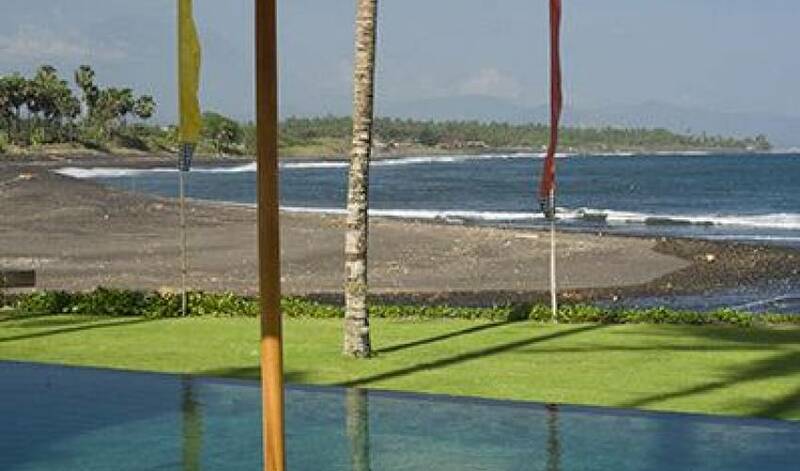 Bordered by rice fields, tobacco plantations, papaya, banana and coconut groves, the property is blessed with spectacular sea views extending towards the southern beaches, Nusa Penida Island and Mt Agung. 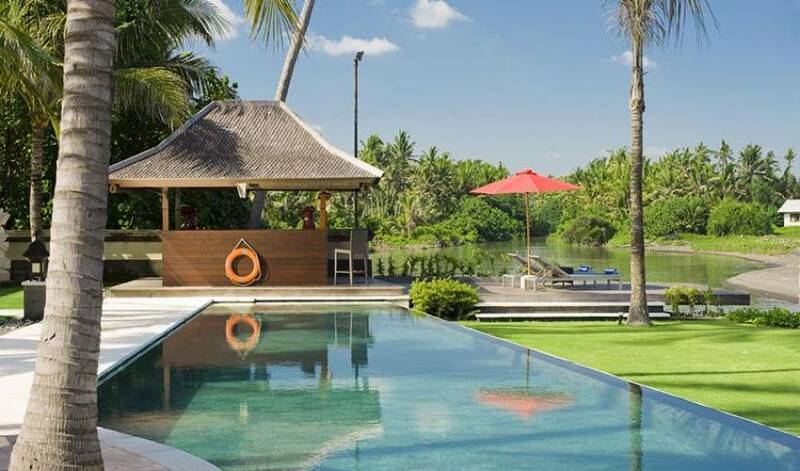 This idyllic coastal retreat offers a chance to experience traditional Balinese life, but is only 30 minutes’ drive from the airport, the fascinating cultural capital of Ubud, and the boutiques, bars and dining delights of Seminyak. 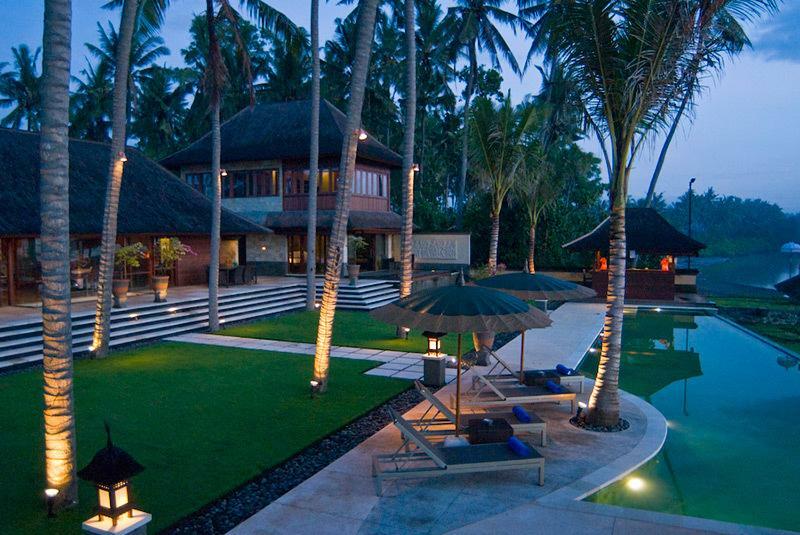 With a car and driver at your disposal, Villa Pushpapuri is perfectly placed for exploring the best of Bali.